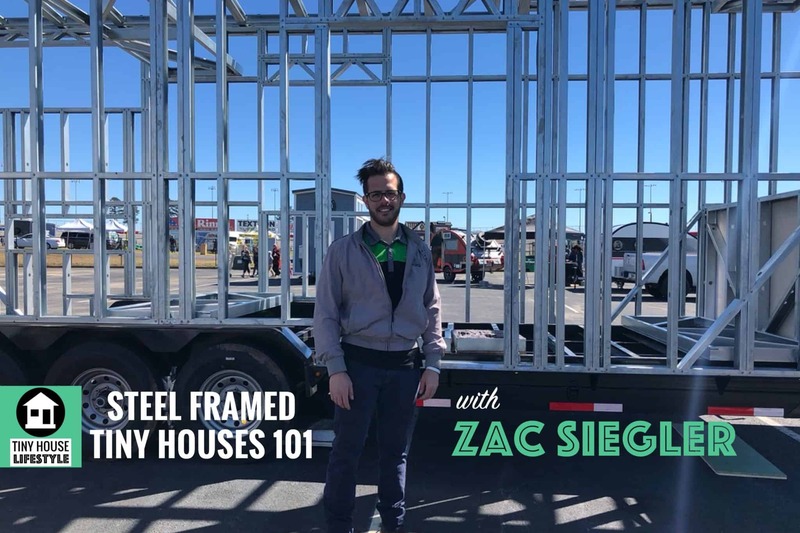 Volstrukt’s Zac Siegler is here to talk about benefits, disadvantages, and cost differences of a steel framed tiny houses. What is metal framing for tiny houses? If you're new to the tiny house movement, you may not realize that there are many ways to frame a tiny home. So what are metal studs and how do they work? Some people hear “steel” and think of the thick red metal that they see in high rises or industrial buildings. 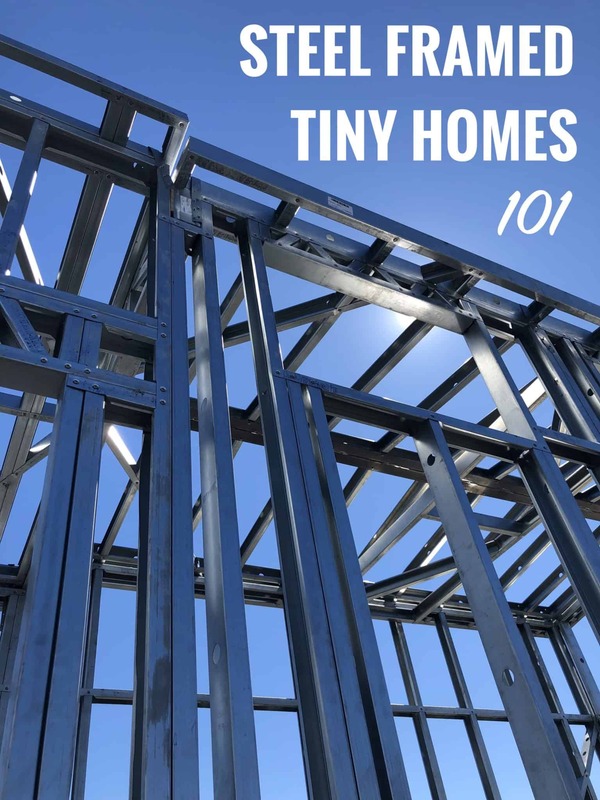 But steel framing for tiny homes are hollow, c-shaped steel pieces. The first big benefit of steel vs. sticks is weight. The frames look similar. You'll most likely frame your structure 16-in on center so you can attach your interior and exterior sheathing, and you'll insulate between those studs. Because wood is a solid product (a 2x4 rectangle), it's taking up all the space of that material. Metal studs are a thin sheet of steel bent into the shape of a stud, so it's mostly hollow space. In terms of weight, you're looking at 40-60% weight savings for steel vs. wood. If you've shopped for lumber at a big box store lately, you probably had to sort through a big pile of materials to find a few straight, consistent pieces. With metal framing, each piece is manufactured and is therefore much more consistent and precise. Steel is also not affected by moisture, so your frame won't be affected by weather in the same way that a wood frame is. Steel provides a 25 to 1 strength to weight ratio compared to wood (pound for pound). Compared to a wood frame, steel framing offers 10 times the strength. Building with steel is similar to building with wood. you can use for the most part, the same materials you would use with a wood frame. Drywall, sheathing, insulation, and other materials all attach to steel framing in a similar way. Insulating a steel frame can be more challenging than insulating a wood frame, especially in places where there are tight channels created by horizontal trusses or multiple angled pieces. Putting in batt insulation is more difficult due to additional cutting. Thermal bridging is the potential for energy to transfer through your frame to the inside of the house, and this is one area where wood has a leg up. It's advisable to use some kind of continuous layer of insulation or “outsulation” on the outside of the house. Zac says that a big advantage of metal framing vs. SIPs is that metal is more flexible- it's possible to alter your frame after it's built, and to run wires and pipes in the walls. With a SIP, everything is pre-determined and it can be difficult to run wires after the fact. Do steel frames require a special trailer? The easiest way to attach a steel frame to your trailer is to have a trailer with a 3.5” perimeter L channel that runs all the way around- that way you have a flat surface that you can drill through. That allows you to set a bolt through your frame and tighten it down to your trailer. While hiring out a wood frame vs. buying a panelized steel frame costs about the same, there are some differences. For a wood frame, you'll spend about 30% on materials and 60% on labor. For Steel, that's flipped: You spend 60% on materials and 30% on labor. How do metal studs work for framing a tiny house? How does the rest of the build compare? Are special tools or materials required once you have your steel frame? What fasteners are required for steel framing? Does steel framing require additional or special insulation techniques? How do you hang a heavy shelf or piece of art inside of a steel framed house? How does a steel frame interact with the steel trailer? Is a special trailer required? How does Volstrukt literally “print” steel frames for tiny houses? How does the cost differ between Steel and Wood? Do Steel-Framed tiny houses have to be pre-fabbed? Can I do a completely custom design?